Students will be thrilled and excited with this book and these techniques. They won’t believe how easy it is to use up their scraps and difficult-to-use fabrics. They will be thanking you forever for introducing this book to them! Encourage interaction between students. They can help each other pick from their scraps and exchange scraps too! Organize a swap meet beforehand in your shop or at your retreat. 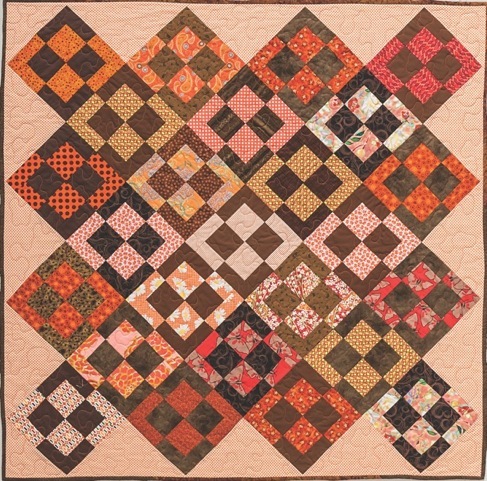 Learn how to efficiently use difficult and oddly shaped scraps to make beautiful scrap quilts. Use scrap fabrics that you never thought you’d use again. This class will assist the student in learning how to use a simple set of 3 squares to create 16 different quilts. One quilt in particular, Treasure Box, will be featured. Every quilt in the book uses only these 3 square sizes. Contrary to most scrap-quilting books, Quilts for Scrap Lovers uses actual scraps that are ordinarily hard to use because of shape, size, or print. Learn how to cut scraps as you go along during other projects with a plan in mind as to what they will be used for in the future by using this system. Though the students are using scraps, there is a need for students to purchase background fabrics in large amounts. They will need to purchase the book and the templates. They will need backing fabric and binding fabric, along with batting and other quilting supplies. If they don’t have a lot of scrap fabrics of a particular color, you can encourage purchase of fat quarters in certain colorways. The book also talks about how to combine modern fabrics with traditional ones to freshen up the appearance of a scrap quilt. You can have those more modern fabrics available as pieces to add in. 2-3 hours, or the class can be done over a couple of days. If the class is used for a retreat or multiple-day event, all 16 quilts can be explored by doing a block from each quilt or a segment of each quilt. • A variety of scraps that are large enough to accommodate the 3 ½˝, 4 ½˝, and 5 ½˝ block templates. Students can also bring fat quarters. -There should be a combination of scraps with significant contrast. It would be wise for students to select a color combination and choose lights and darks within this combination. For example, in a color scheme of red, white, and blue, the red and blue scraps might be the darks, while the white fabrics might be the lights. -Students may have some of the required sizes, but it is unlikely that they will have all 3. Students should purchase the template set for class. Students should bring a wide variety of scraps in lights, mediums, and darks, and about 4 yards of a solid white or gray fabric for “blank” blocks. It may be easier for students to bring totes of scraps separated into colors, such as a tote of red, a tote of blue, a tote of green, and so on. These scraps should be large enough to accommodate the 5 ½˝ block template. Students should then have all the basic sewing supplies mentioned above as well. Make certain that there is ample table space for cutting the scraps, as well as sufficient sewing space. You will also need enough irons and ironing boards, one per 3 students. The instructor should read the first chapters of the book so that they understand the basics of color, intensity, and spacing, the concepts that are the mainstays of the book. These first few chapters will also give instructors information on how to use the templates on the scraps. It’s a very simple technique, but the instructor should be able to present to the students the concepts of how to use them on those difficult fabrics.